It’s funny how recipes come about. Apparently the first known written recipe is said to be 4,000 years old and it was handed down by a god, I’m not sure if that god actually wrote it himself but the recipe was said to have been given to men by the Sumerian god Enki, the written version was found contained in a hymn dedicated to the beer goddess Ninkasi and it was a recipe to make beer! Beer at this time was the national fermented drink of ancient Babylonia. But really, we used to eat all of our food raw up until the deliberate use of fire which was approximately in 1,400,000BC in Africa or 500,000BC in Asia depending on which theory is believed. And the original method of cooking was roasting over a fire. Back to recipes and this one in particular. I had a 500gm piece of stewing beef. It looked a bit fatty. The day before I had made some pasata using the left overs of my tomato harvest. I had bagged and frozen two bags for later use and had about a cup of juice from the bottom of the roasting pan (I roast my toms with herbs and seasoning to make a great pasata). I had an onion, carrots, some garlic a tin of chopped tomatoes and a tin of large white beans. Oh what to do with these ingredients. I Googled beef and tomato and found about a million recipes and thought, make one up! So this recipe is a bit Fabada Asturiana esq but without the chorizo, pork belly and morcilla. It is best to prepare this about 3 or 4 hours before eating as it needs a slow cook. In a sturdy pot heat the olive oil and fry the garlic and onions until soft. Add the beef and brown it then sprinkle with the flour and give it a good stir to cover everything in the pan. This will help to thicken the sauce. Now add the carrots, pasata, chopped tomatoes and beef stock. If you don’t have beef stock, use a stock pot, they work just fine. Season with the thyme, pimenton, chili, bay leaf, salt and pepper and bring the pot to a boil then simmer for a couple of hours on a low heat. After an hour or so add the pearl barley as it will take on the flavours. About half an hour before you want to eat drain the beans and give them a rinse then add them to the pot and remove the lid. This will help the sauce to reduce a bit. 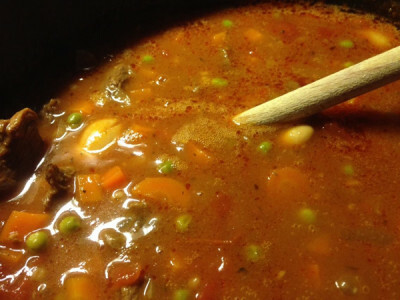 After 2 – 3 hours you shoud be ready to serve and the beef will be as tender as you like! Serve with some nice crusty rustical bread! Jamie Oliver will be stealing this one I think!